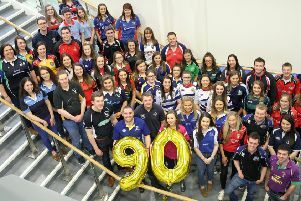 The Young Farmers’ Clubs of Ulster (YFCU) will host its third agri conference on Saturday, January 26th 2019. Entitled ‘Shaping Our Agri Culture’, the event will be centred on the La Mon Hotel, close to Comber in Co Down. It will comprise a mix of formal presentations, workshops and farm visits. Proceedings will culminate with a conference dinner on the Saturday evening. “We want to enthuse and excite delegates about the tremendous prospects that exist as they plan the future of their own farming and related businesses. The day will begin with visits to three case study farms, all of which are at the forefront of their respective sectors. The farms in question are the specialist sheep production business managed by John and Billy Martin, near Greyabbey, the Newtownards dairy farm of Roger McCracken and the Seaforde arable and poultry business of Neill Patterson. Alan Jagoe will give the keynote address at the conference. He is the current vice chairman of Agri Aware and a former president of Macra na Feirme. Lindsay Haddon, advertising and sales promotion manager, Massey Ferguson UK and Ireland said: “It is a great pleasure to once again support the YFCU Agricultural conference. “Massey Ferguson is firmly focused on the new generation of farmers, and inspiring young people about the business of agriculture. “Success in farming means always striving to be better. It is essential to optimise opportunities and have a clear strategy to realise your ambitions. “Farming will always be a challenging profession but the long-term prospects for agriculture are strong. Commenting on the significance of the upcoming conference, Ulster Farmers’ Union president Ivor Ferguson said: “The UFU is delighted to have the opportunity to sponsor the YFCU’s ‘ Shaping Our Agri Culture conference’. The conference fee, which includes lunch and dinner, is £35 per head for YFCU members, £45 for Ulster Farmers’ Union members and £55 for non-members. For further information contact conference organiser Corrina Fleming on (028) 90 9037 0713: email: corrina.fleming@yfcu.org.